If you are noticing EIFS issues with your residential or commercial property, you are going to need the services of a professional EIFS inspector. No matter how small the issue may appear, it is imperative to have it inspected because this small issue can lead to bigger and more costly issues down the road. If you are noticing any EIFS problems on your home or commercial building, you need experienced inspection experts to identify the problem and here at Cliff Kapson Consulting, Inc. we have 20 years of residential and commercial property inspections. To learn more about our property inspections or if you would like more information on our consulting services, give us a call today at 888-304-3437. You can also reach us by filling out the easy to use contact form located on this page and one of our knowledgeable associates will get back to you as soon as possible. During the mid-90s, concerns surrounding EIFS arose due to its performance. During a multitude of inspections, EIFS homes showed moisture intrusion and damage to sub-sheathing and framing were commonly discovered. 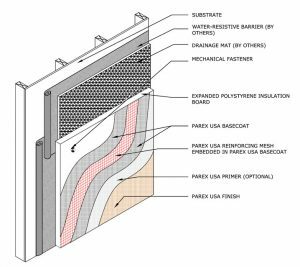 The argument was that the barrier EIF system was flawed from the beginning because it does not allow even incidental moisture to escape from its cladding. Despite the issues that have been noted with EIFS, they are easier to inspect than most exterior materials. This can be construed as an advantage because unlike other materials that can lock moisture in and go unnoticed for years while causing more damage, EIFS issues can be identified earlier on. Through years of inspections, we have found that moisture intrusion most often happens in areas of transition such as door sills, window frames, balcony and deck attachments, and roof flashing. Extensive structural damage can happen when water volume is intrusive, large, and frequent. For more information on our EIFS inspection and consulting services or if you have any questions about our other areas of inspection, call us today at 888-304-3437. Or simply fill out the contact form on this page and we will respond shortly.